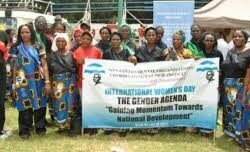 THE Non-Governmental Organisation Coordinating Council (NGOCC) is saddened that despite efforts to increase the number of women adopted as councilors and members of parliament, the number has remained marginally low, Engwase Mwale has said. Ms. Mwale said according to the summary report by the Media Institute in Southern Africa (MISA) and Media Liaison Committee report on how public media was covering the 2016 campaigns, the public media had concentrated on male candidates who had taken up about 70 percent of the coverage compared to about 30 percent for women. Speaking in Siavonga yesterday at the News Editors forum review being held by the NGOCC under the auspices of coordinated women in politics (WIP), Ms. Mwale said efforts to change the status of women in Zambia had continued to be frustrated by a number of legal impediments, lack of political will, poverty and financial resources. Ms. Mwale pointed out that currently, the representation of female members of parliament stood at 17 percent while at local government level the figure was even more depressing at 6 percent. She said that there was need for women in the country to position themselves by taking part in politics stating that the women movement was deeply concerned that the number of women participating in politics had remained low. “As a deliberate measure, we have decided to hold this review meeting just before August 11 general elections to see if there are certain lessons we could learn and build on. One of the mistakes we have made as a movement in our quest to increase the participation of women has been to wait until the last moment. This time around we are starting to prepare now for 2021,’’ she said. And Ms. Mwale said the review meeting was aimed at coming up with strategies that would be put in place and see how the agenda could be carried forward by enhancing women participation beyond August 11. Ms. Mwale noted that over the last three months, the media had undertaken various programs and carried news articles that were aimed at promoting women in politics. Ms. Mwale, however, appealed to the media to continue addressing the areas of concern that hindered them from effective coverage of women‘s active participation in politics.